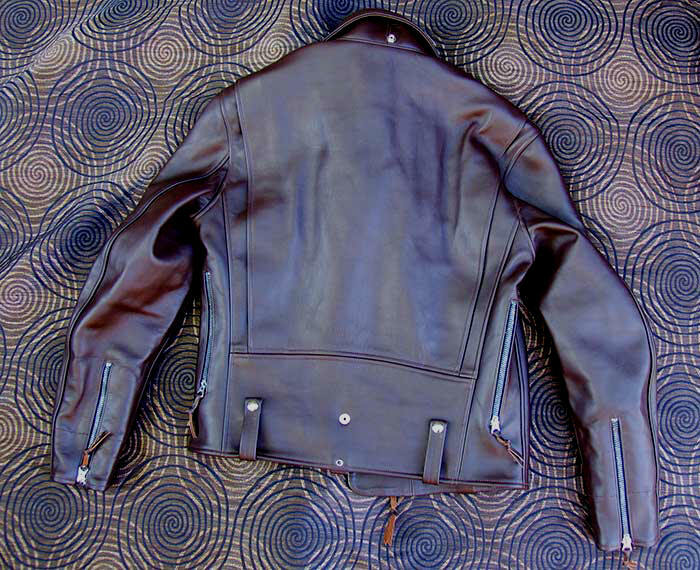 The amazing LOST WORLDS rendering of the highly regarded J23 BUCO Horsehide Motorcycle Jacket from the old Joseph Buegeleisen Co. of Detroit. (Identical to J22 except J22 had wool lining.) Originals often command excessive sums on the vintage market. A remarkable, stunningly beautiful D-pocket 4+ oz. 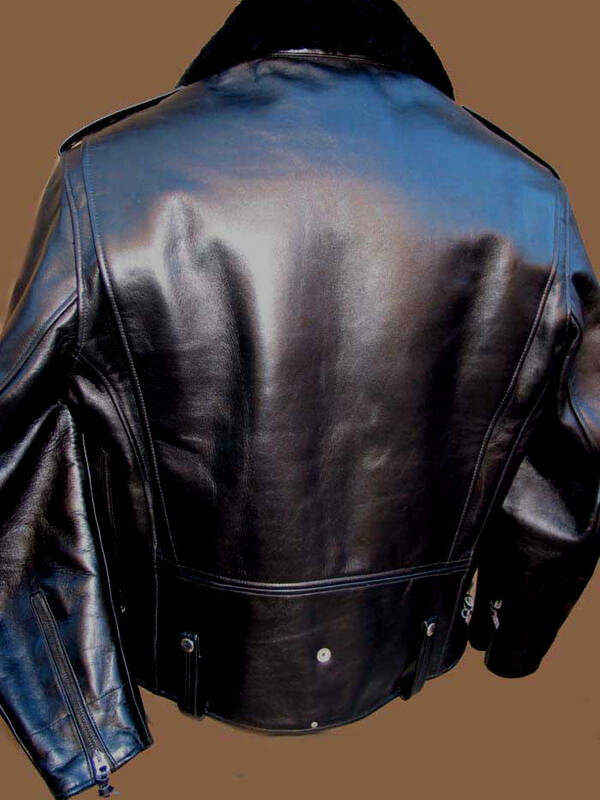 Black Horsehide Motorcycle Jacket from the 1950s. 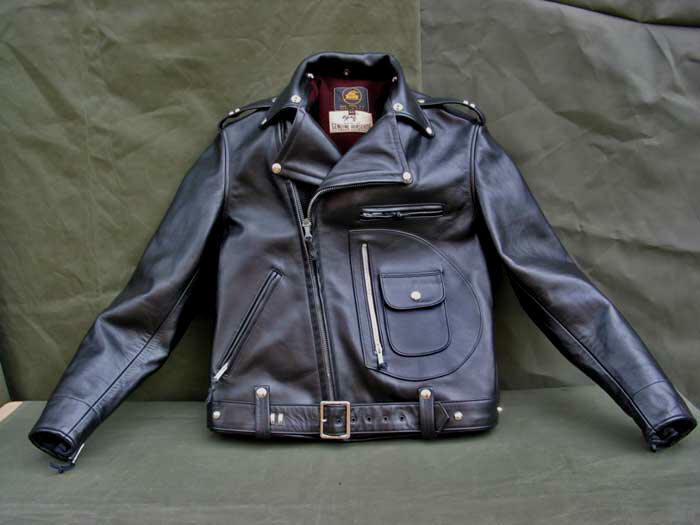 The best Horsehide in the world, and not by a little, from our own tannery! Inimitable LOST WORLDS authenticity, quality and workmanship. 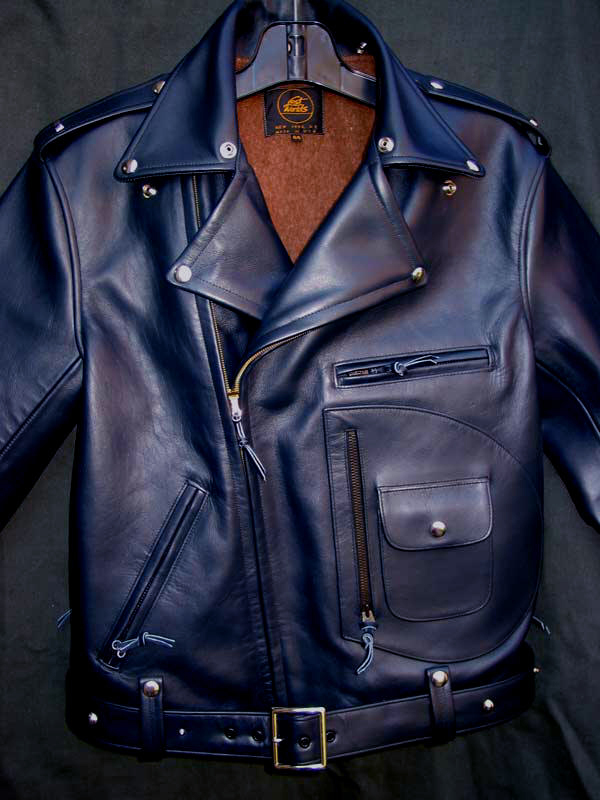 A lifetime purchase: Correct horsehide jackets routinely outlive their owners and are passed down as heirlooms. 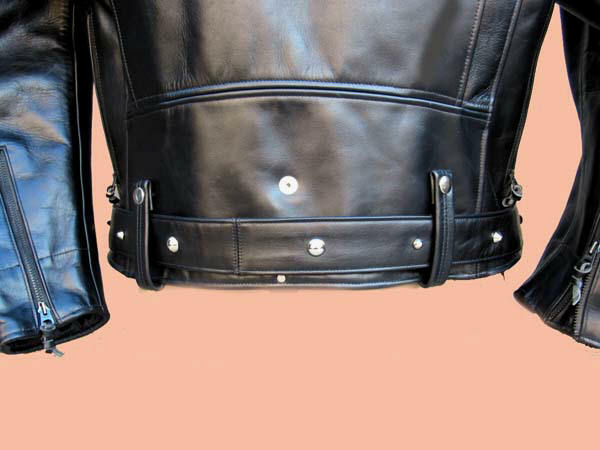 (Yes, there's as much difference between different makers' horsehide as between cars, people, galaxies!) 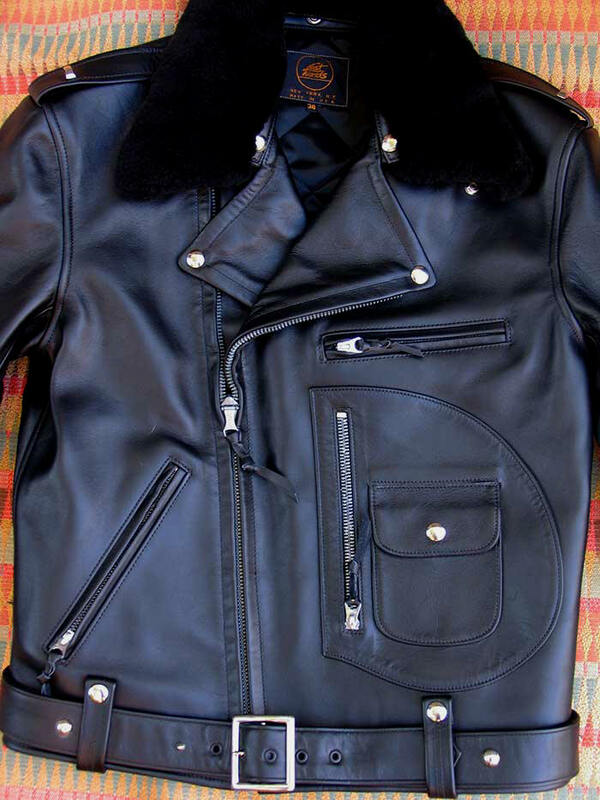 There are some who think mere hype separates a $1490.00 jacket from cheaper jackets. Are a Carrera and Sienna (!) separated merely by hype (or testosterone)? Yet, we do believe that for some, many even, a cheaper, thinner, softer jacket might serve their needs better than ours. Not everyone needs something like our dreadnought Buco J23. These are for a special kind of rider. 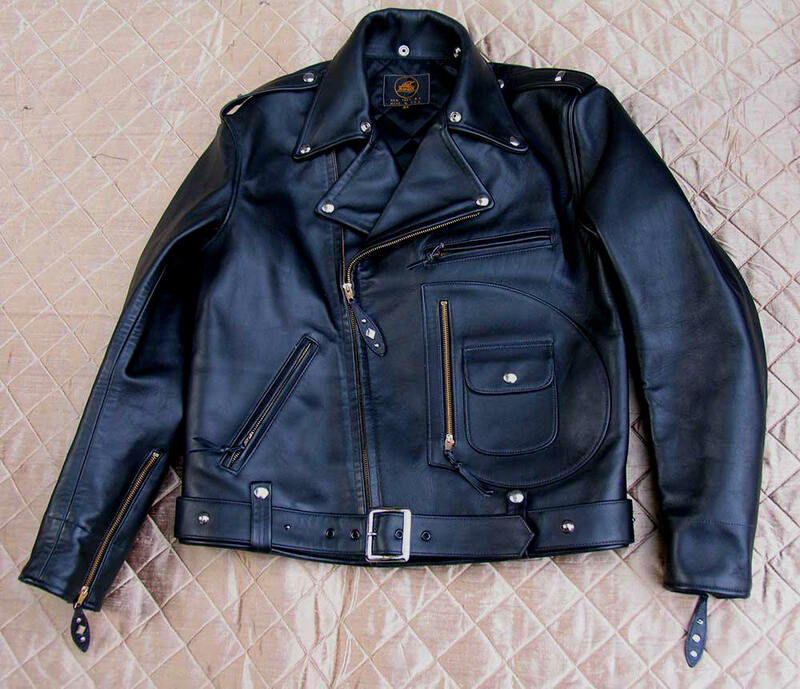 The knowledgeable know from experience the extraordinary protection a LOST WORLDS Horsehide jacket can afford in potentially serious road mishaps. Our jackets are equipment, pure and simple, not fashion. If your bike sports safety and speed modifications yet you consider a jacket just a weather or fashion accessory, speak to real riders. They know. 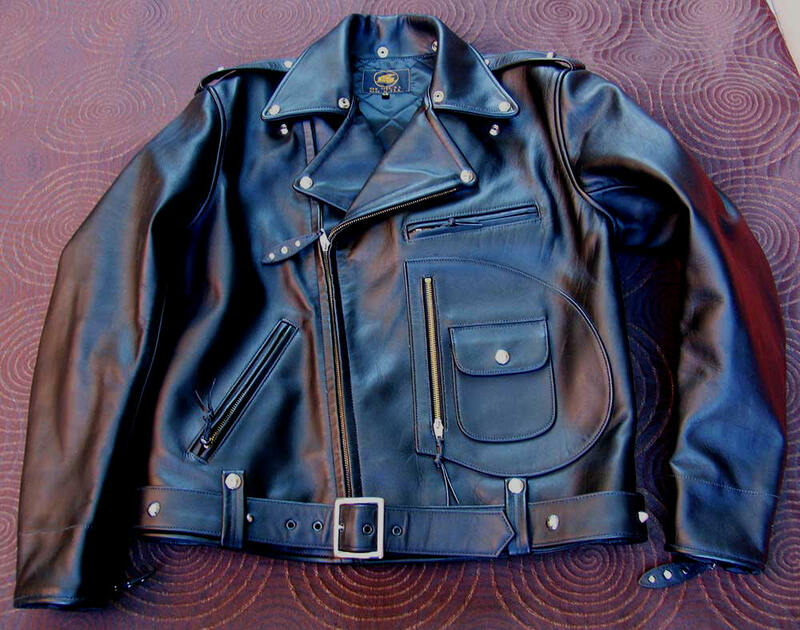 Unlike weaker hides, genuine Lost Worlds Chrome-Tanned Horsehide never loses strength as it softens and molds to its owner. (Oh, yeah, originals were Vegetable-Tanned -- hilarious!) It doesn't whiten, bleed, mottle, "pull-up" if you look at it or rub against a door frame. 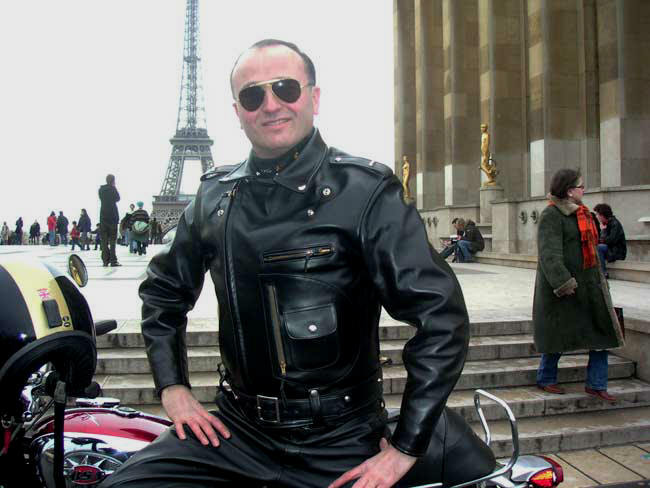 That's wannabe leather for social mediasts and the insecurely uncool. 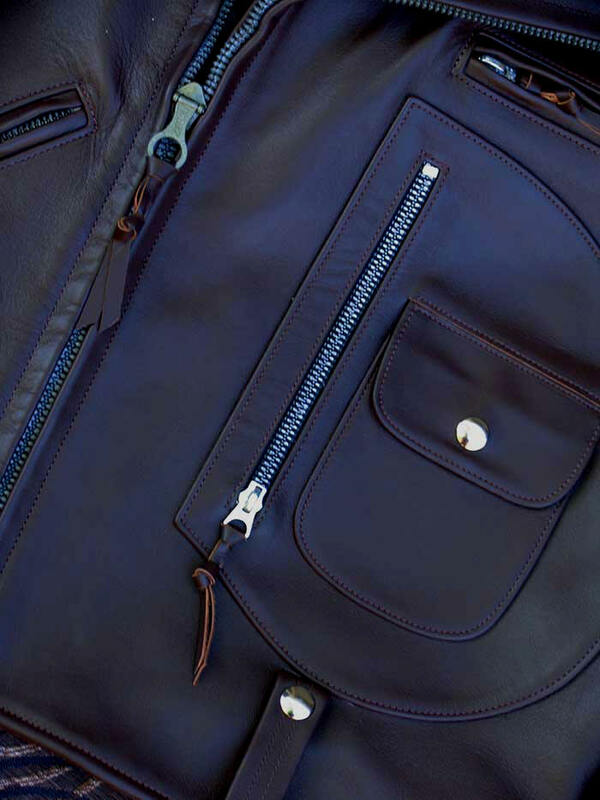 The beauty and comfort of our hides increase with use and age without losing durability, incredible water repellency and protection -- why old manufacturers and riders always preferred Horsehide. 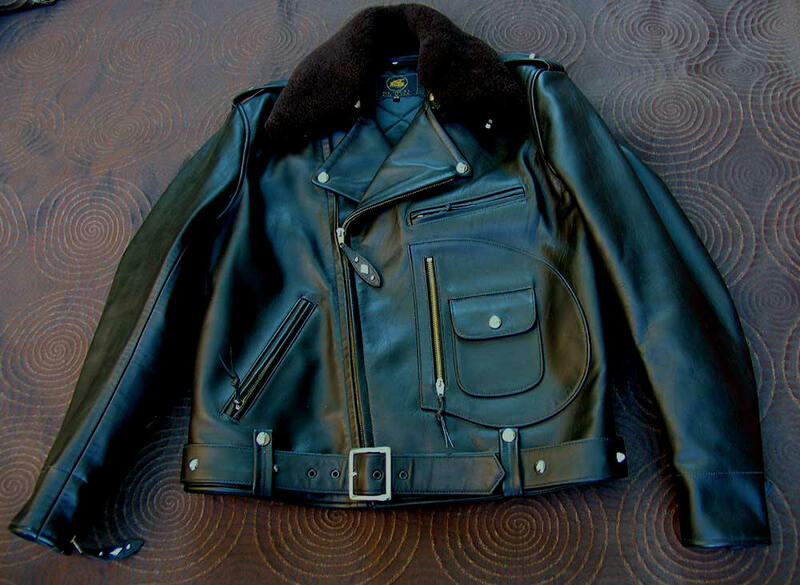 (Yet even among originals variations in horsehide quality exist, the difference being that back then there were, generally, excellent and good hides, less crap. Today the field is MUCH narrower and, unsurprisingly, more duplicitous, i.e., cowhide being passed off to unwary as horsehide.) Incidentally, no original had tougher, heavier, more beautiful natural grain Horsehides than ours. American-made at our own LOST WORLDS NYC factory, of course, sewn to standards that simply must be seen to be believed. Quality that routinely exceeds originals. Examine the close-ups above; the detailing, precision, articulation; the extraordinary tightness of our stitching. Then look at other, even expensive, jackets. You be the judge. 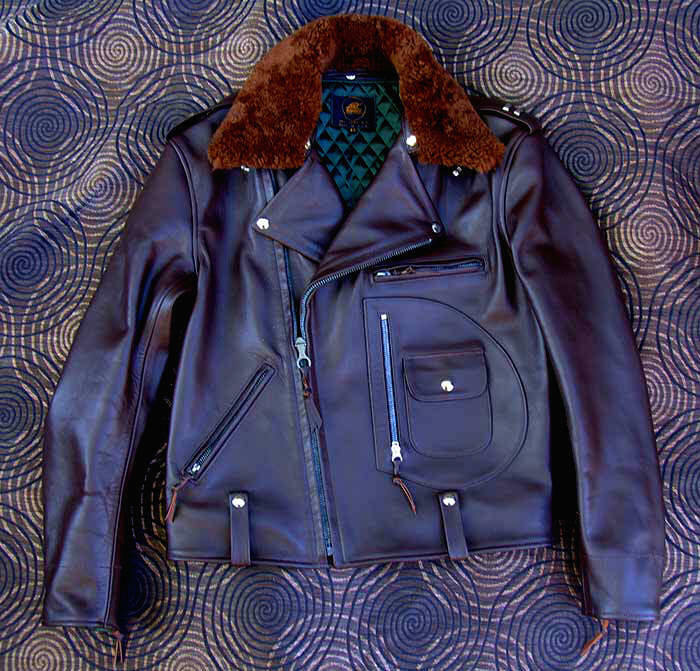 Heavy Duty Quilted 100% Pure Nylon Lining, Detachable Lamb Shearling (Mouton) Collar. Bi-swing Back. Brass Talon or Scovill NOS Military Zippers. 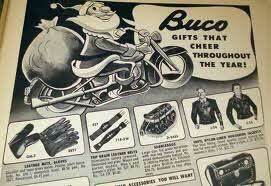 For those who've dreamed of owning a BUCO but could never find their size, the condition they desired or one reasonably priced. A lifetime purchase, like every LOST WORLDS classic. Those who believe that originals are it and nothing else ... back to eBay! 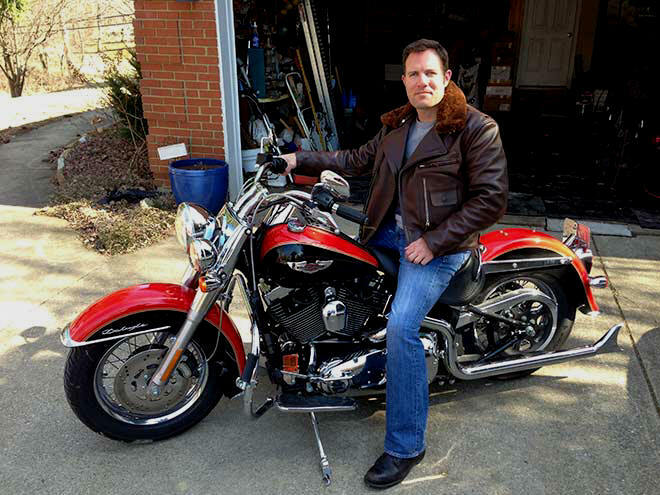 "Wanted to let you know I received the Custom J23; Custom Police Jacket; and Easy Rider. All arrived in perfect condition. I couldn't be more pleased! All fit perfectly, thanks so much for modifying the Police Jacket; prefer it this way. 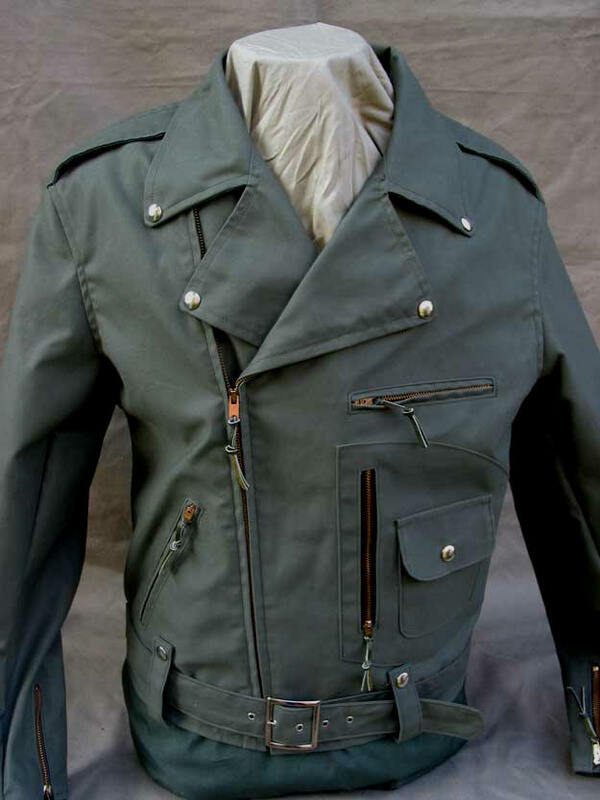 Unusual look without the epaulets but with the side zippers. Leather inside pockets are very cool. J23 is also just right for me, like it without the epaulets. You were correct on size 50 rather than 48 on that one.... The Easy Rider in the 3 oounce seems like a lightweight compared to the other 2, good for warmer weather. Your size 48 in the other 2 fit me perfectly, even sleeve length and jacket length are perfect....not sure how you pull that off, but you've done it again. Also, please thank you workers, beautiful workmanship, just perfect....so rare to see nowadays." 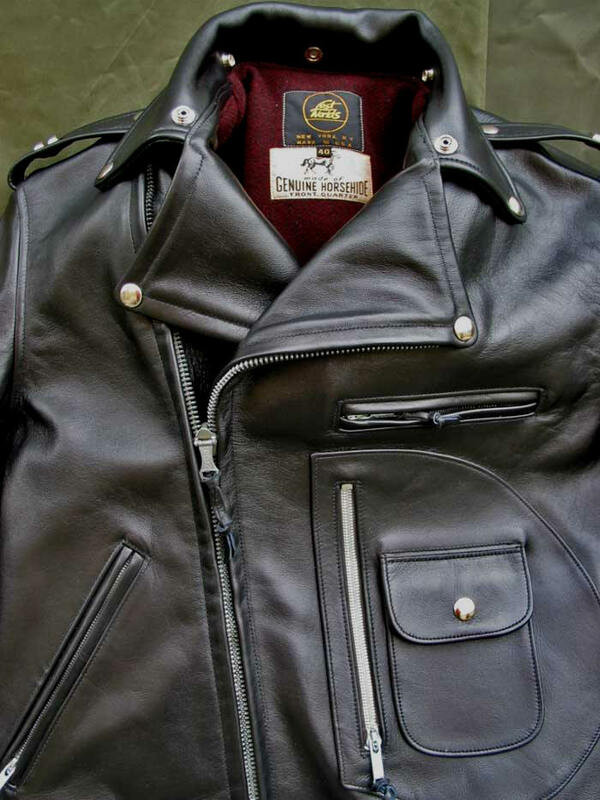 "The jacket is BEAUTIFUL, thanks for the obviously hard work you put into it. I very much appreciate your workmanship. Can I purchase an additional light brown mouton collar from you? I wouldn't mind keeping the black but I really like the contrast of the lighter brown. 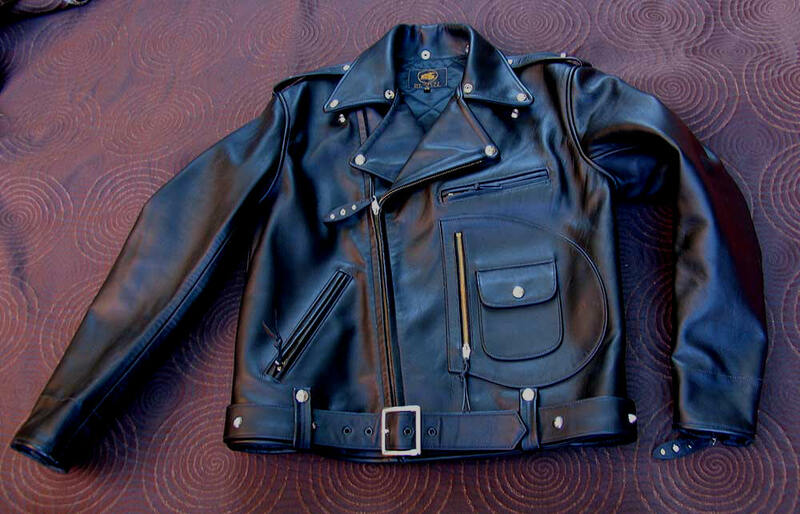 Please let me know and thanks again for a remarkable jacket!" "Jacket Just Arrived It is Gorgeous!!!!!!!!!!!!!! The Green lining is going to be great for cold morning rides. and the Russet Horsehide is fantastic! 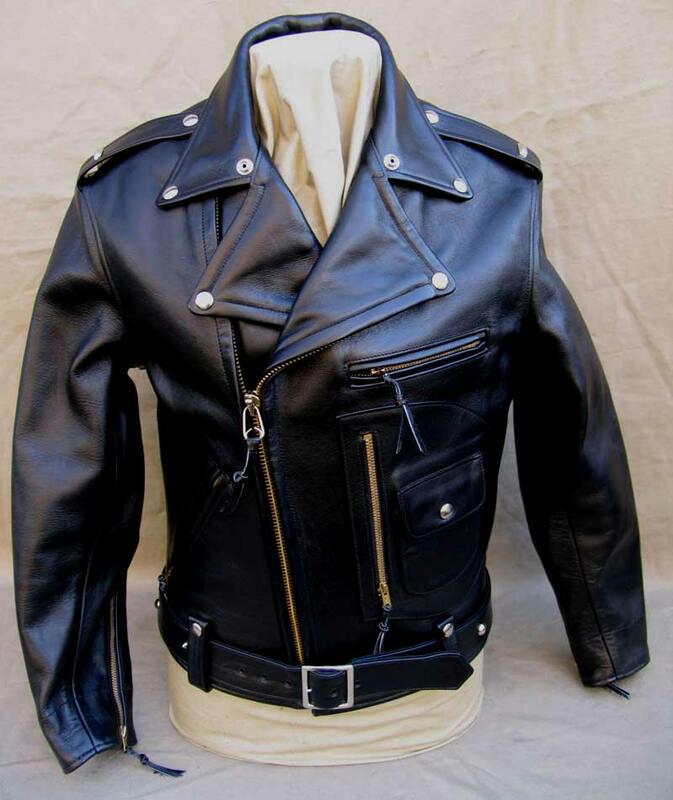 I like this horsehide it feels like it will break in really well. As usual the tailoring is impeccable and the belt! I am really glad my wife convinced me to get it. The collar is super warm so everything is complete! 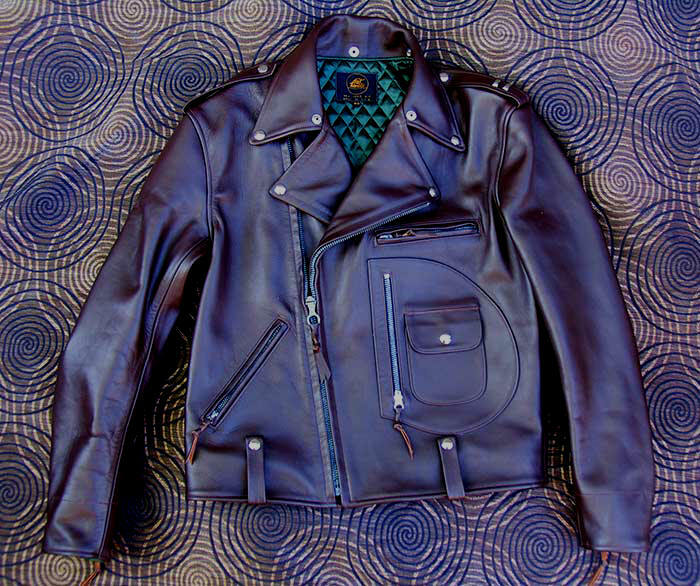 Thanks again for your superlative craftsmanship"
"I got home this evening & opened up the jacket ----Perfect. It exceeded my expectations. 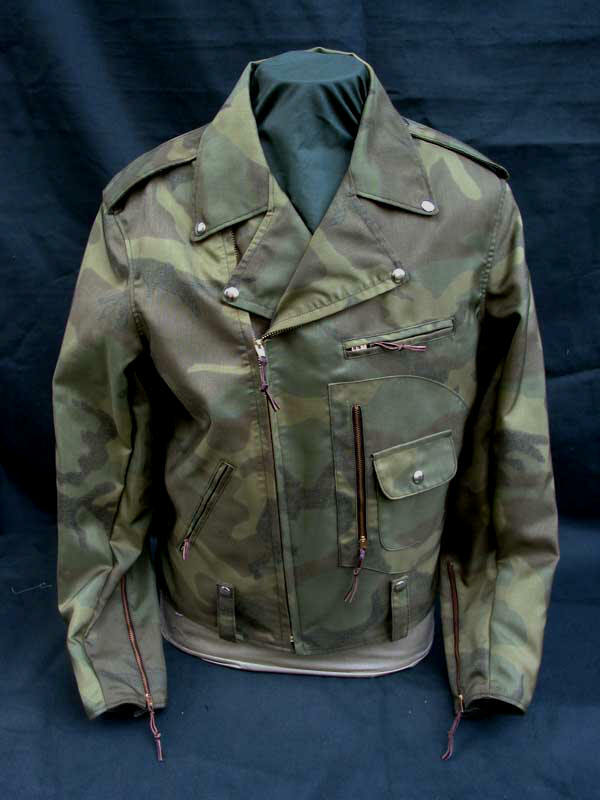 This jacket is badass. Thank you, Sir." 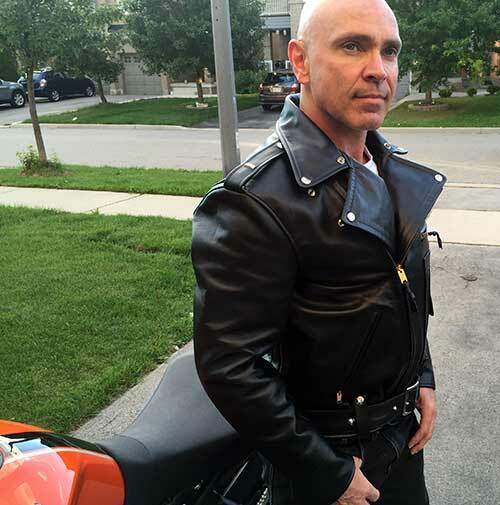 "Hi Stuart: received my jacket this afternoon. It is unbelievable! To say that this thing is heavy duty would be a complete understatement. Not only that�..the workmanship is beautiful. Thank you so much for producing such special and unique products that are made right here in the U.S.A. I am so happy. Best to you." "I received my Buco J23. A substantial and functional piece of art. 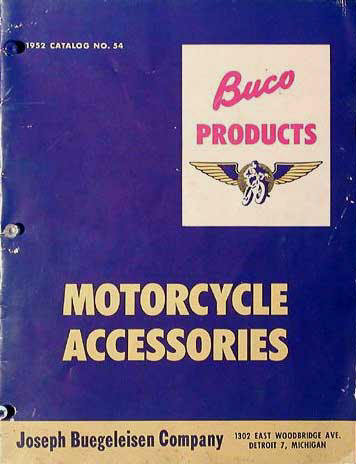 As a rider and firefighter I greatly appreciate having the assurance of protection; the Buco J23 delivers." 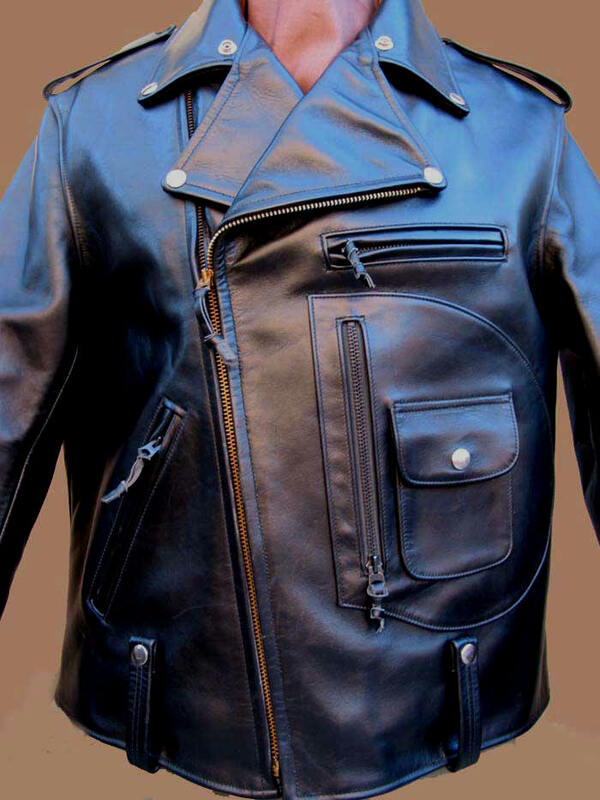 Buco J23 Horsehide Motorcycle Jacket w/ Mouton Collar attached, Optional Horsehide Belt and CUSTOM NOS Original Crown Zippers. CUSTOM BUCO J23: Double-sided Vintage Burgundy Wool Lining; NOS Crown Zipper; Double Epaulet Bars. 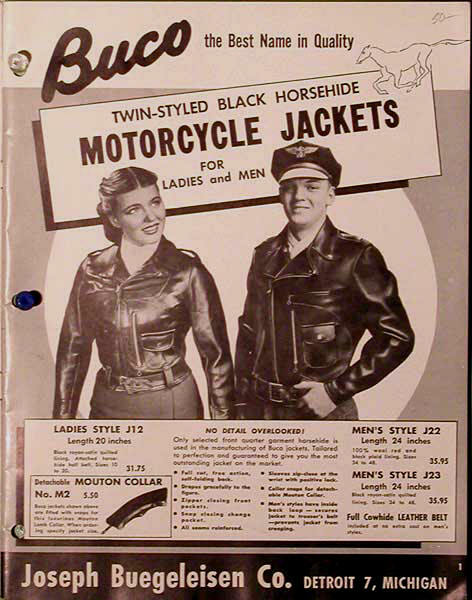 Among collectors and enthusiasts, the very scarce original Horsehide Motorcycle Jackets made in the 1940s and 1950s in custom colors are highly prized and very valuable. Since LOST WORLDS purchases and tans the best Horsehides in the world to our own specifications, we have the capability to make small runs of such custom colors. 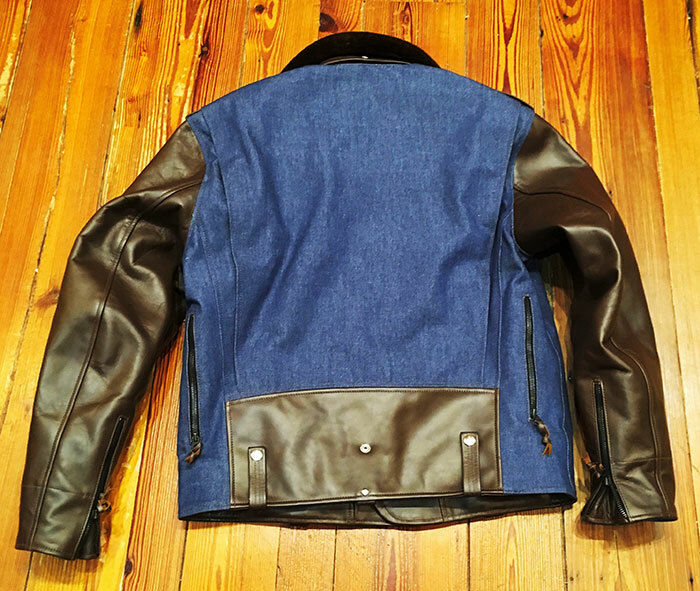 Navy Blue is such an All-American color and so hip and masculine that we knew it would look great in Horsehide. 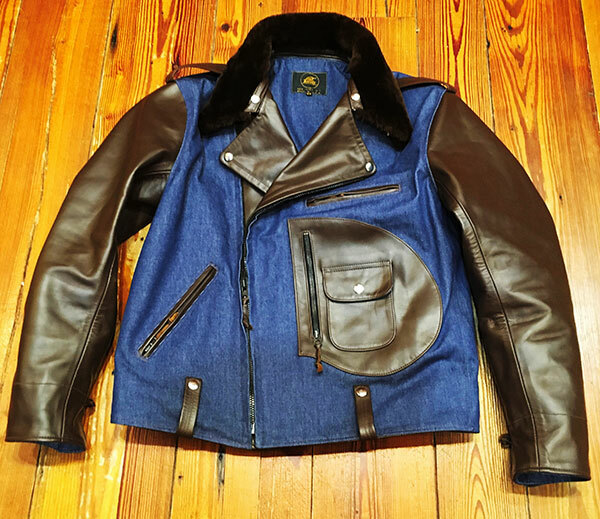 This Custom J23 was ordered by a long-time LOST WORLDS devotee with Alpaca lining, original NOS #5 CROWN Brass Frontal Zipper and NOS Talon Parkerized Copper #5 Zippers for pockets/sleeves. Wow! 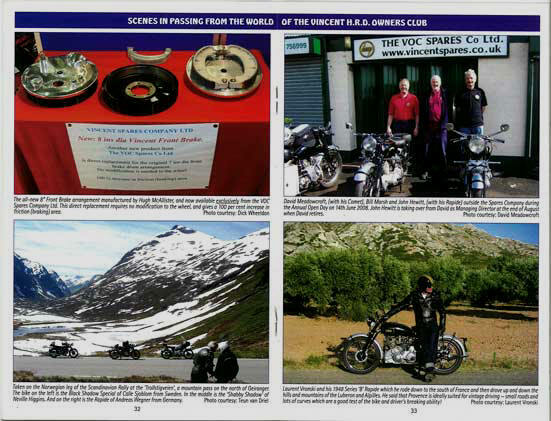 Here's one of our many European customers aptly suited for his lovely '69 BSA Lightning in a month-old Lost Worlds Buco J23, to the right in his Vincent. Note perfect, trim fit. 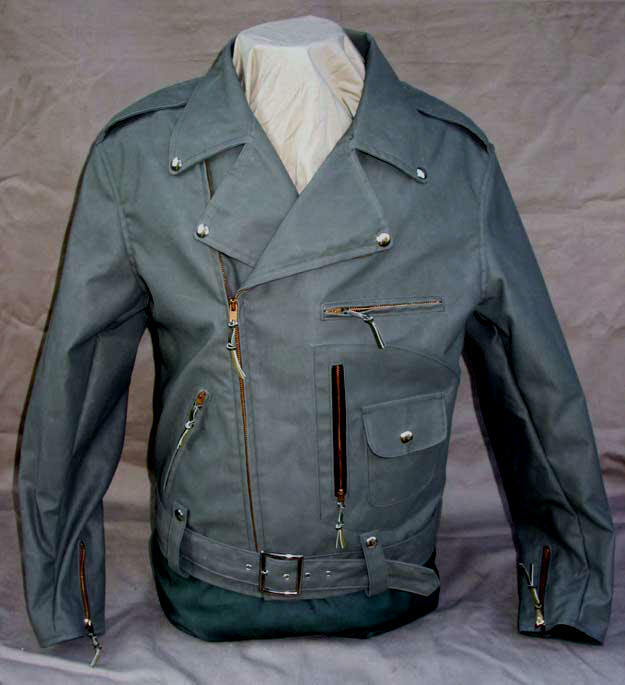 NOS 1982 USAF Flame-Retardant, Water-Repellant 100% Sage Sateen Cotton. Lined in waterproof 81/19 US Military Cotton Oxford. Supremely functional, comfortable and built like a truck by LOST WORLDS. Sewn-in Belt. Limited to stocks of material on hand. 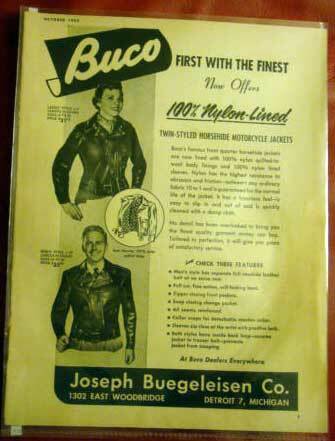 BUCO J23 MOTORCYCLE JACKET Ballistic Nylon. BRAND NEW. 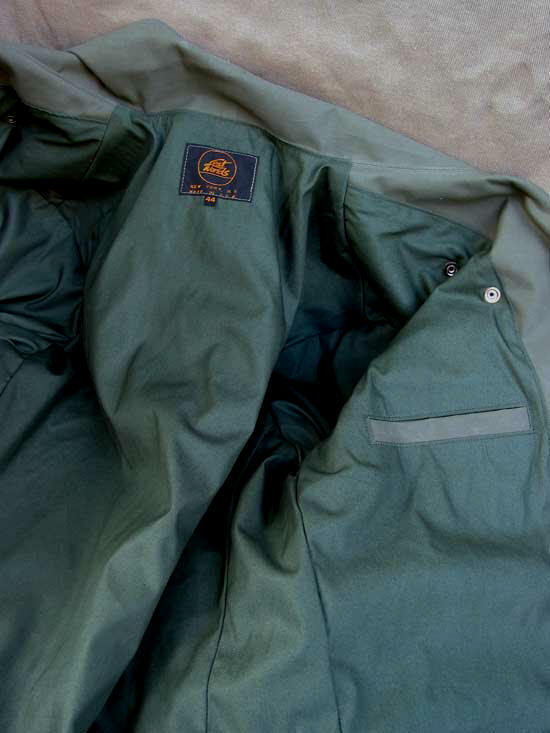 For years we made Ballistic Nylon versions of LOST WORLDS styles for overseas wholesale buyers. When we left that business we saved a small quantity of this material for our Retail customers. Ballistic Nylon is magically tough: it can't be torn and will reform when punctured! 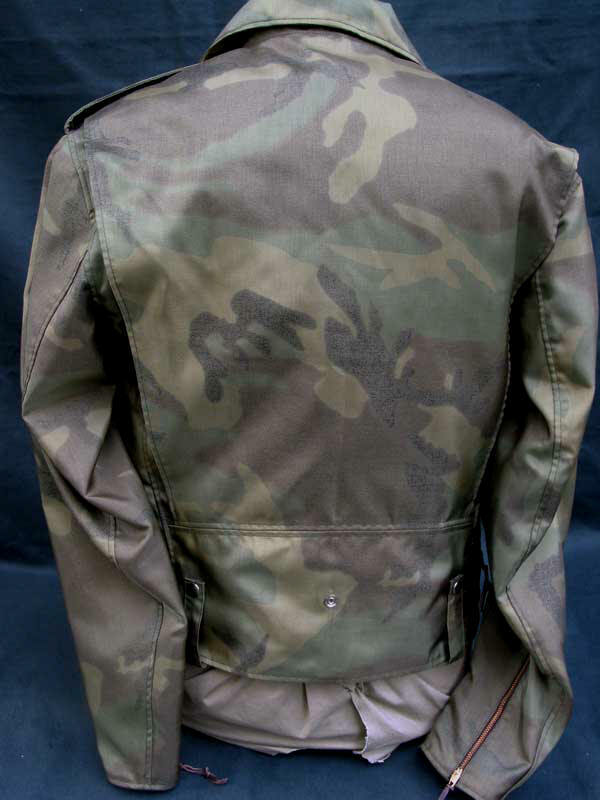 This is US military material but comfortable and flexible, exactly what serious motorcyclists require. The color is what we call Foliage -- the reverse side of Woodland Camo -- giving a unique, water color-like, subtle shading that resembles landscape viewed from altitude. In our famed Buco J23 it's startingly unique in the very best sense, combining 1950s design with 21st century textile wizardry. 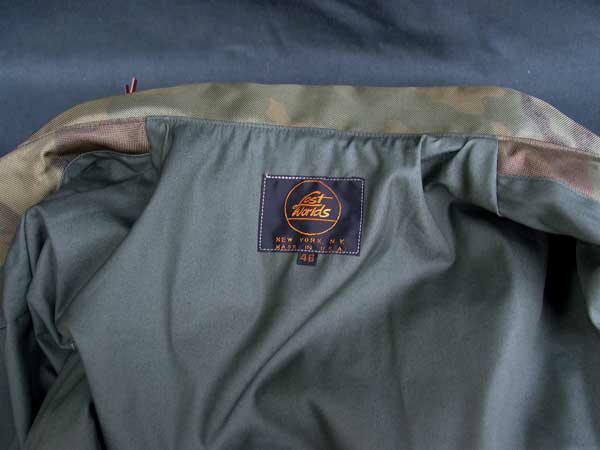 Lined in 100% waterproof military Oxford (81%Cotton/19%Nylon), soft yet tearproof. 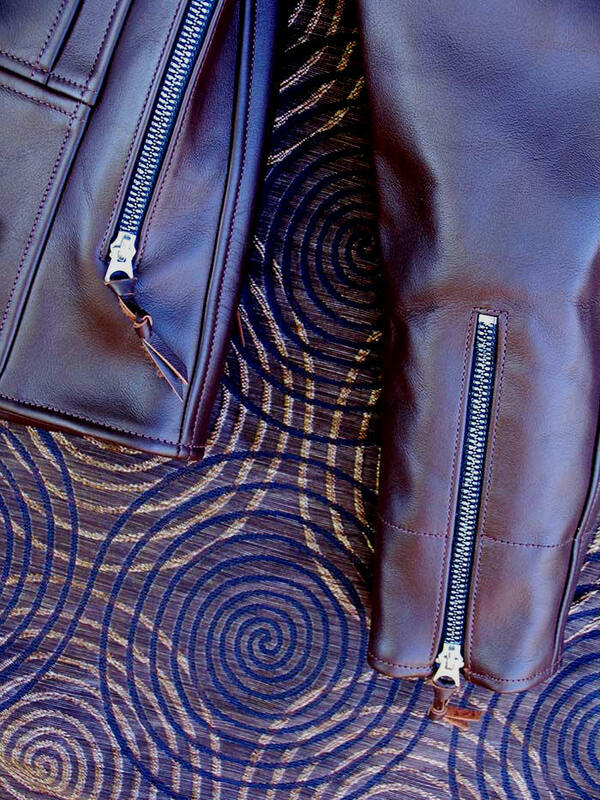 American zippers. 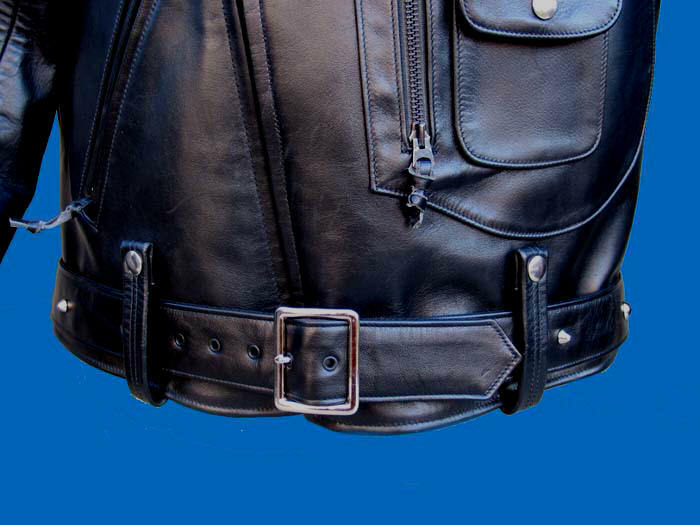 Interior chest pocket. 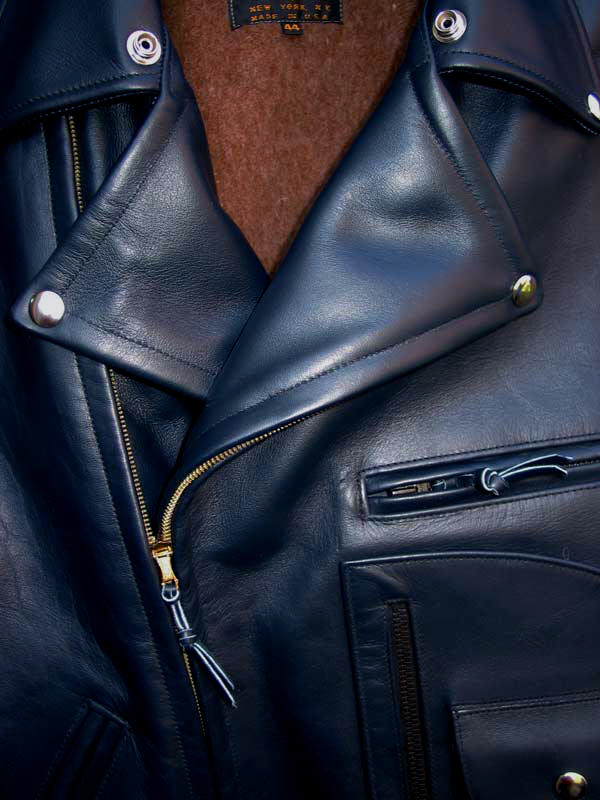 Made of our same extraordinary Horsehide as the J23 jacket. Lined with 15 oz. Black Cotton Duck (to protect finish from wear and abrasion). 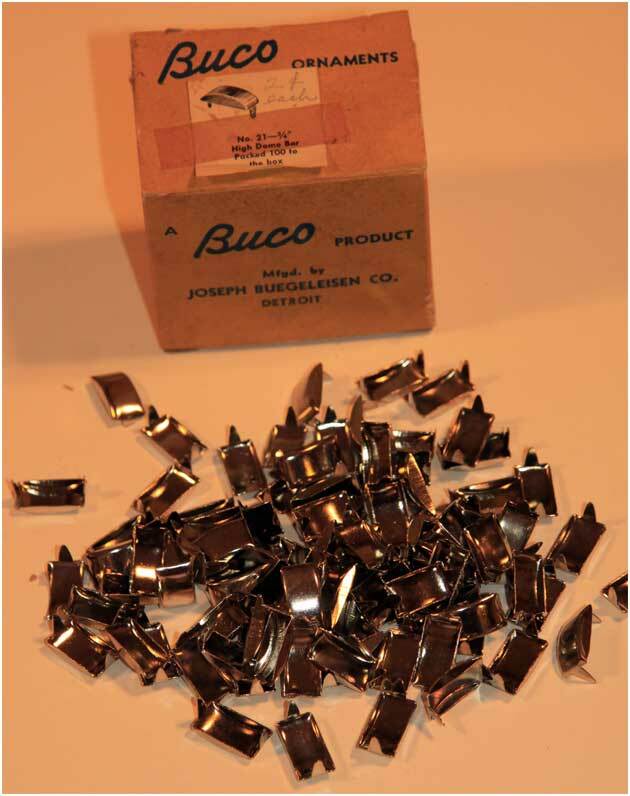 Our nickel decorative studs and bars -- sand-cast to our specs, not the stampings that even old BUCOs use. (Current M/C decorative hardware used by mfgs. is Asian-made of the thinnest, weakest, cheapest stampings imaginable.) Our Belt Buckle is also sand-cast Nickel finished Brass. Made for us in England. LOST WORLDS hardware teaches customers about quality almost as much as our workmanship and hides. After our jackets one simply doesn't go back to what he wore before. �2019 VINTAGE HYDE CORP. All Rights Reserved.